No one ever believes how easy it is to make our crispy southern-style chicken that tastes fried—but isn't! So we made this handy video to prove it. Remove skin from all chicken pieces except wings. Place chicken in large resealable plastic bag. Add dressing. Seal bag; turn to evenly coat chicken with dressing. Refrigerate 30 min. to marinate. Heat oven to 400°F. Place coating mix in pie plate or shallow dish. Dip chicken in coating mix, turning to evenly coat both sides of each piece. Place in single layer on baking sheet. Sprinkle with any remaining coating mix. Discard bag and marinade. Bake 40 to 45 min. or until chicken is done (165°F). 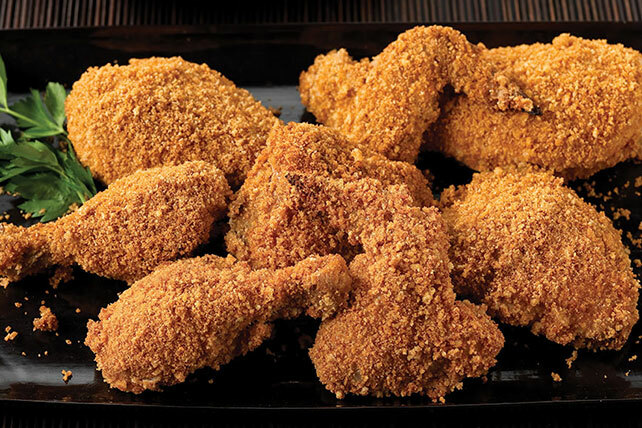 Try our made-over version of fried chicken. You'll save 90 calories and 9 g of fat per serving when compared to the same amount of fried chicken. For a spicier version, add hot sauce to taste to dressing before using to marinate the chicken.